It’s still fairly rare to see a videogame begin life as a Flash game, and then make its way over to traditional consoles and other gaming platforms. 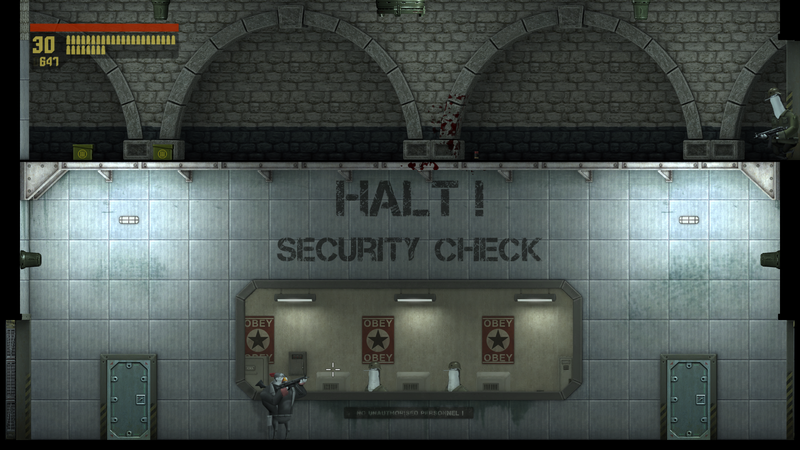 But that’s exactly what happened when Rocketbirds: Hardboiled Chicken released in 2011. The game evidently did well enough to warrant a sequel, and so here we are with Rocketbirds 2: Evolution. Starring the same talking chicken, and even featuring the same antagonist, is this simply more of the same? Or is some innovation hiding out this time around? Rocketbirds 2 has a moderately entertaining story, but the plot seems a bit bi-polar – on the one hand, you have talking animals which include, but are not limited to, gigantic penguins who talk a bit like Arnold Schwarzenegger (and all the generally lighthearted silliness which accompanies that), but at the same time one character throws up in disgust when faced with a massive pile of deceased chicken bodies. Ultimately, though, the story remains geared towards simple fun. Unfortunately, some of you may get too frustrated with the game’s controls to ever see the story through to its ending. Rocketbirds 2 controls like a twin-stick shooter, except that you use L1 to jump and R1/R2 to melee/fire your weapon. It seems to work well enough, until you are required to shoot with precision such as during a turret battle or against any boss sequences. Here, it becomes painfully evident that you cannot aim very accurately unless you are standing still, which then turns you into a sitting duck (or is that chicken?) against the game’s enemies. This is another case of the game being a bit two-faced – while the controls are arcadey, you cannot aim directly below Hardboiled Chicken, because he maneuvers somewhat realistically when aiming, in stark contrast to the setting of the game. In addition to frustrating firing, most of the game’s weapons are inadequate. For most bosses, don’t even bother using anything but the hunting rifle, and later the grenade launchers. Since aiming is so imprecise, the few bullets of the automatic or semi-automatic guns that do hit your target hardly do damage, so every shot counts. These two weapons are also hilariously overpowered, to the point that you don’t want to use anything else. Ammo is very common, so there’s no worry of running out, either. Most of Rocketbirds 2’s levels consist of running around, killing a couple of roomfuls of enemies, finding one with a keycard, and continuing. After a few chapters, you unlock two special cell phones, which enable you to remotely control enemies that also have cell phones. The first phone enables you to control the enemy, but only to move around – if they are spotted by another enemy character, they are told to go back to their post. The second phone enables complete mind control, which allows you to go through some of the current level as that enemy, killing others who get in your way. This can serve to make the game a little easier, and is also required for you to solve some of the game’s puzzles. It’s a decent mechanic that changes things up a little during the middle of the game. Rocketbirds 2 maintains the same aesthetic of the first game, which includes a realistic-looking environment with unrealistic characters strewn throughout. While the game plays in 2D, the background are all fully rendered in 3D. There is even an intriguing camera effect, whereby the camera pans left/right, opposite to the direction in which you are moving, and you can see around corners of hallways in the background. It’s a type of parallax which is pleasing to see. The game also maintains a steady, high framerate throughout, though this isn’t a particularly taxing game to begin with. The band New World Revolution returns to provide a surprisingly kickass soundtrack, and is definitely a highlight of the game, if you’re a fan of the rock genre. Music is not constant, and when you’re not busy fighting the soundtrack often turns itself off to wait for more action. Other than the music, the campaign is fully voiced, which is always appreciated no matter what the game. Drop in/drop out co-op is supported, for up to four players! Major kudos to developer Ratloop for including this rarely-seen feature. In fact, it’s not much of a stretch to say that the co-op Rescue mode is the best part of Rocketbirds 2. It features procedurally-generated levels, to ensure endless replayability. If you get killed, your character is knocked out, with the option of teammates to revive you. But a lot of the game’s issues, such as imprecise controls and an occasionally frustrating checkpoint system can still frustrate here. Still, it’s always better to go into combat with a buddy, and Rocketbirds 2 is that rare game that lets you do so with up to three other players. Rocketbirds 2 is a game strictly for fans of the series. With imprecise controls yet precise aiming requirements, you can expect to curse your way through most of the game’s boss fights (especially those that take place in the air, or under the water, or in space, or, well, anywhere the camera changes perspective). The main campaign is also perhaps less than half the length of the original game, but this time around the co-op fun to be had in the new Rescue mode almost completely makes up for this shortcoming. An excellently fitting soundtrack by New World Revolutions rounds out the package. Some weapon balancing issues mean that you’ll wind up using a small portion of the available arsenal, and the story is all over the place. However, for those looking for a cheap co-op action platformer, this is one to check out. Rocketbirds 2: Evolution review code provided by publisher. For more information on scoring please see our Review Policy here.